Banglore: Just a few days after increasing the ambit of luxury taxes in hospitals to ICU beds, government seems to be backtracking from its decision, after seeing objection from all ends. 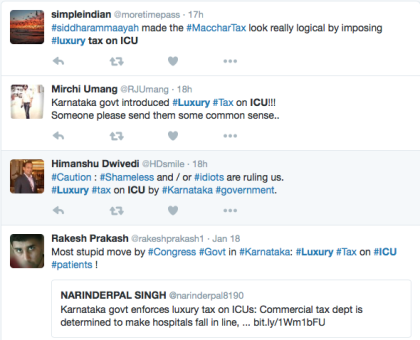 The decision of the government to levy luxury taxes on ICUs had met with strong disapproval from the medical fraternity and the general public alike. 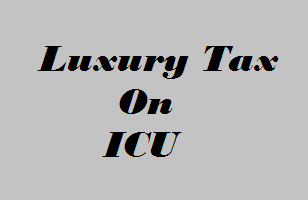 “People get admitted in the ICU as a matter of necessity and in search of critical care, not for obtaining luxuries”, a doctor had pointed out. The department of commercial taxes had earlier begun to levy taxes on the deluxe and super-deluxe rooms of private hospitals, on account of additional facilities like TV, air-conditioning, telephone,etc and soon had extended the ambit of taxation to ICU beds applying similar logic. As reported by Banglore Mirror, An angry chief minister Siddaramaiah on Tuesday afternoon summoned a meeting of officials from the commercial taxes department and verbally instructed them to cancel the order on the grounds that it was against public sentiments. According to sources in the chief minister’s office (CMO), Siddaramaiah lost his cool for not having been kept in the loop about such an order and also about the representations made against it by a few city hospitals.